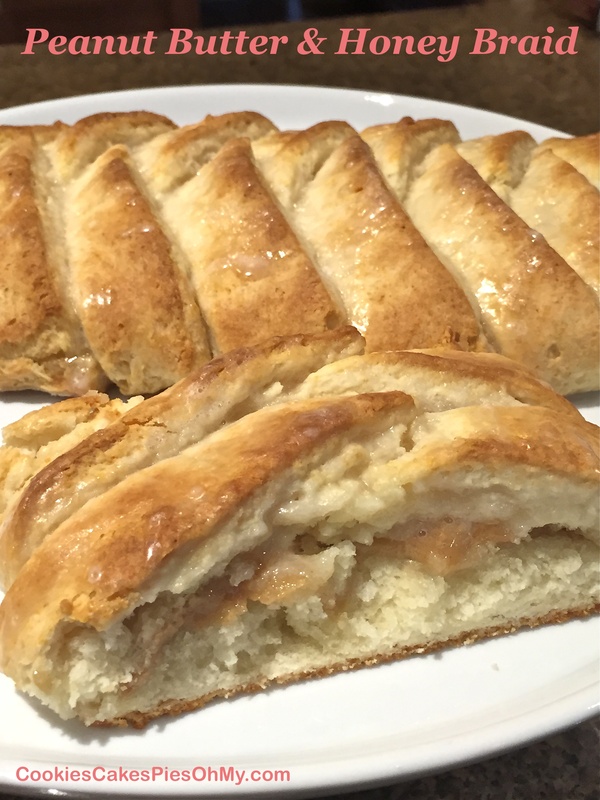 If you’re a bread person like me, make this Peanut Butter & Honey Braid, grab a glass of milk and be happy! Preheat oven to 425°. Cut butter into baking mix until mixture is crumbly. Stir in milk until dough comes together. Turn dough onto floured surface and knead lightly 10 to 12 times. 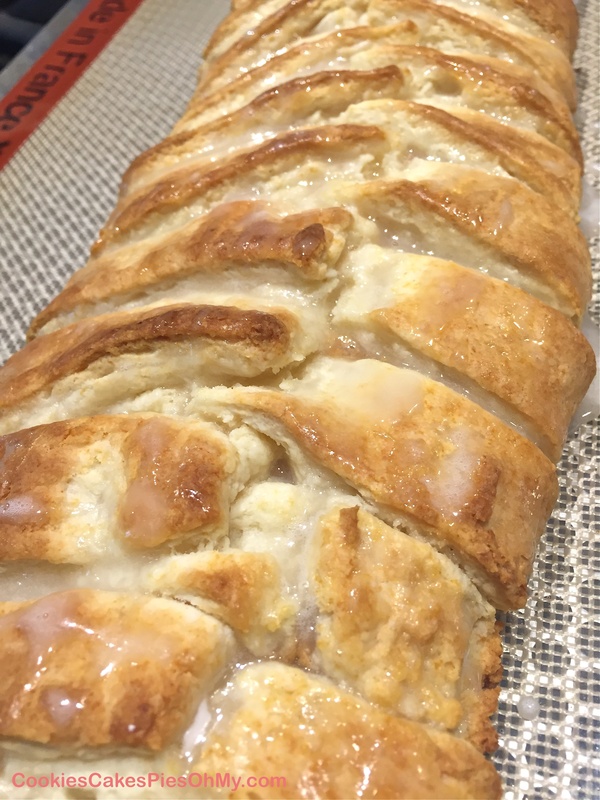 Roll dough into 15″x9″ rectangle. 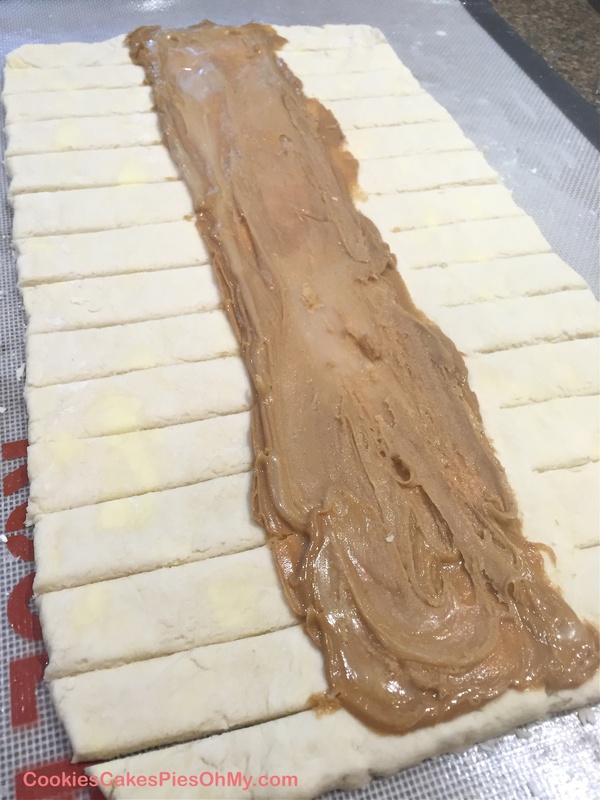 Spread jam lengthwise down center 1/3 of dough (center 3″ pictured below). Make 3” cuts at 1″ intervals on long sides. Fold strips over filling. Pick up with two spatulas and move onto Silpat lined baking sheet or sprayed with non-stick spray. Bake 12-15 minutes or until lightly browned. Glaze with following glaze when slightly cooled. Whisk together until smooth and drizzle over braid. 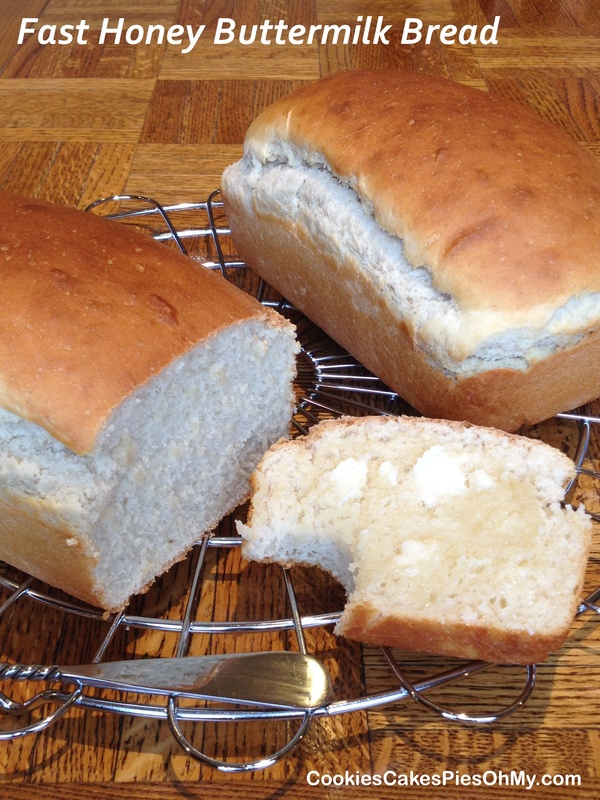 A very popular post here at CookiesCakesPiesOhMy is One Hour Homemade Bread. I wanted to call this Honey Buttermilk Bread “one hour” but it takes longer, about an hour and a half. But, that is not a long wait for the end product of freshly baked bread. In bowl of mixer, add flour and yeast. Pour in warm water over yeast. Add honey, oil, salt and warm buttermilk (heat buttermilk in microwave on 50% until warm, careful not to curdle). Mix for 5 minutes. Spray counter and 2 bread pans with non-stick spray. Shape loaves, place in pans and cover with towel. Let rise 45-60 minutes. Bake at 375° for 25-30 minutes (tent with foil during baking if necessary so loaves don’t get too brown). Makes 2 loaves. Have you seen the section at your local grocery store for Power Bars? It has grown, unbelievable the types, variety, and flavor combinations. Do you think some people are living on these things? I guess if you are on the go and need to refuel in a hurry it’s the perfect product. So, here is a natural and healthy version to make at home for probably half (if not more than half) the cost. Inspired by eatingwell.com. Preheat oven to 350°. Line a 9″x9″ pan with foil and spray with non stick spray. 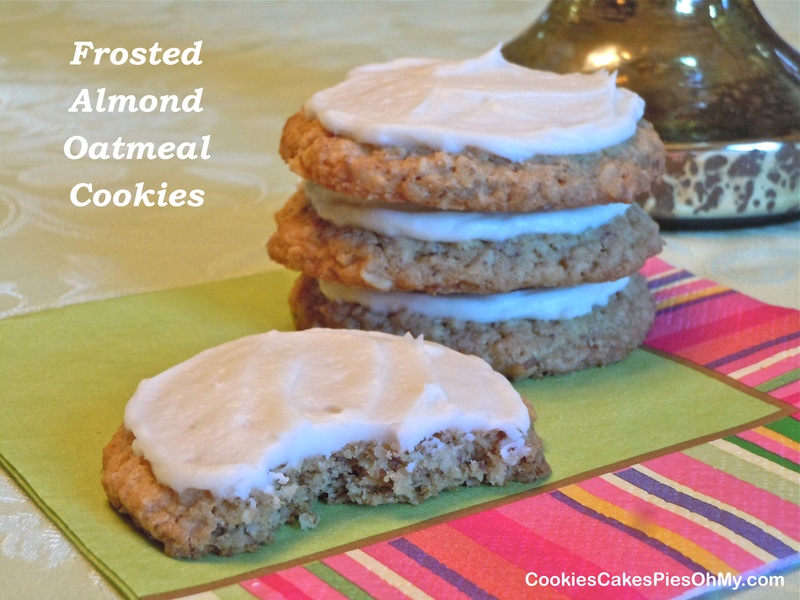 Spread oats, almonds, sunflower seeds, flax seeds, and sesame seeds on baking sheet. Bake until oats are lightly toasted and nuts are fragrant, shaking pan halfway through, about 10 minutes total. Transfer to large bowl. Add rice cereal, raisins, golden raisins, dried cranberries, and dates; toss to combine. Combine peanut butter, sugar, honey, vanilla and salt in small saucepan. Heat over medium-low, stirring frequently, until mixture bubbles lightly, 2 to 5 minutes. Pour peanut butter mixture over dry ingredients and mix thoroughly. Transfer to prepared pan. Lightly coat your hand with cooking spray and press mixture down firmly to make even layer. Refrigerate until firm, about 30 minutes. 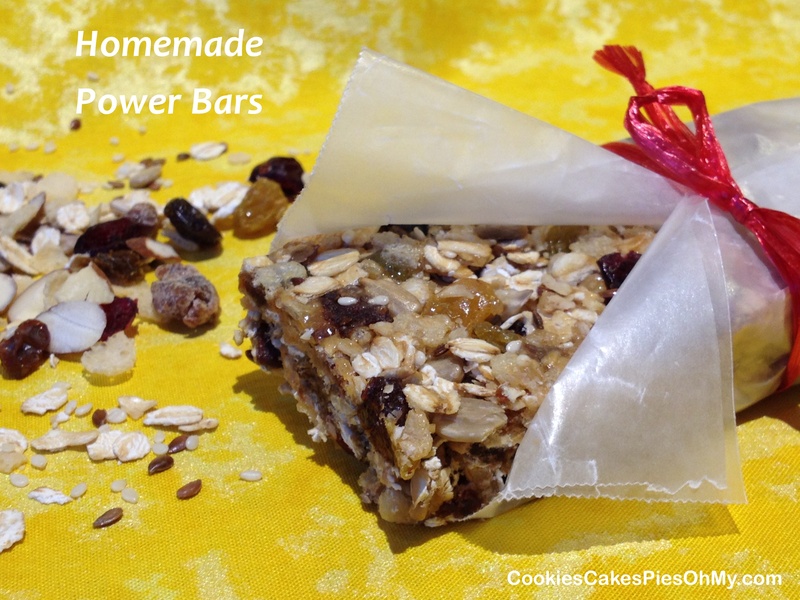 Using foil, pull out of pan; cut into bars. A little taste of Fall. 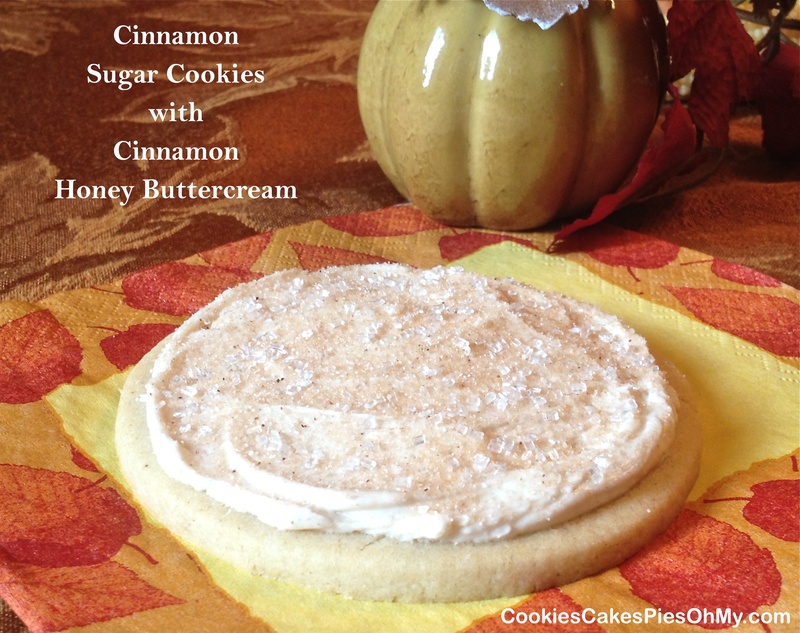 A soft sugar cookie with a hint of cinnamon topped with creamy cinnamon honey butter frosting, um, yum! With electric mixer, cream butter and sugar. Add egg; mix well. Stir together flour, baking powder, cinnamon, and salt; add to creamed mixture. Mix until well combined. Cover and chill at least 3 hours. Preheat oven to 375°. 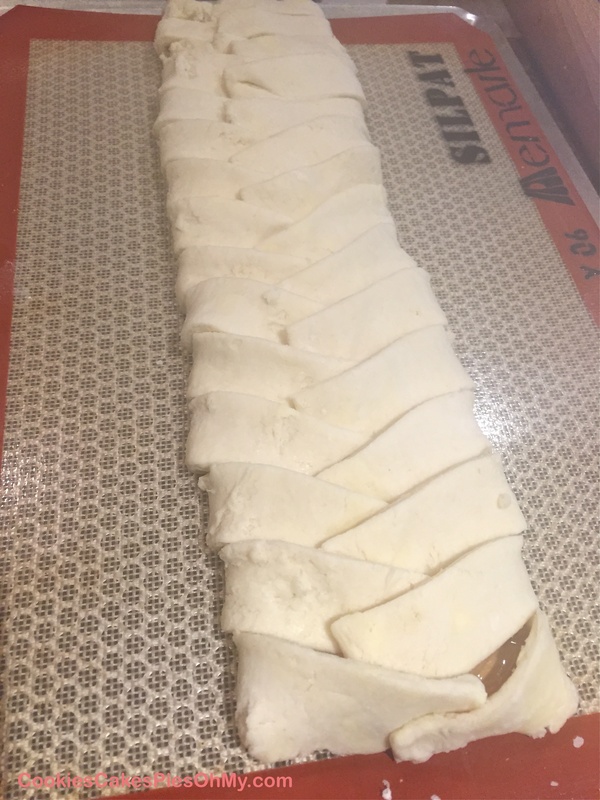 Working with 1/2 of dough at a time, on lightly floured surface roll to 1/4″ thick. Cut with cookie cutter, place on ungreased cookie sheet or Silpat lined sheet. Bake 8 minutes, pull out before edges start to turn golden. Cool completely before frosting. Whip butter with electric mixer until light and creamy. Add powdered sugar, honey, and milk; whip until frosting is a creamy spreading consistency. Frost each cookie and sprinkle with cinnamon sugar and sugar crystals. Makes about 2½ dozen 2½” diameter round cookies or 16-4″ diameter round cookies. 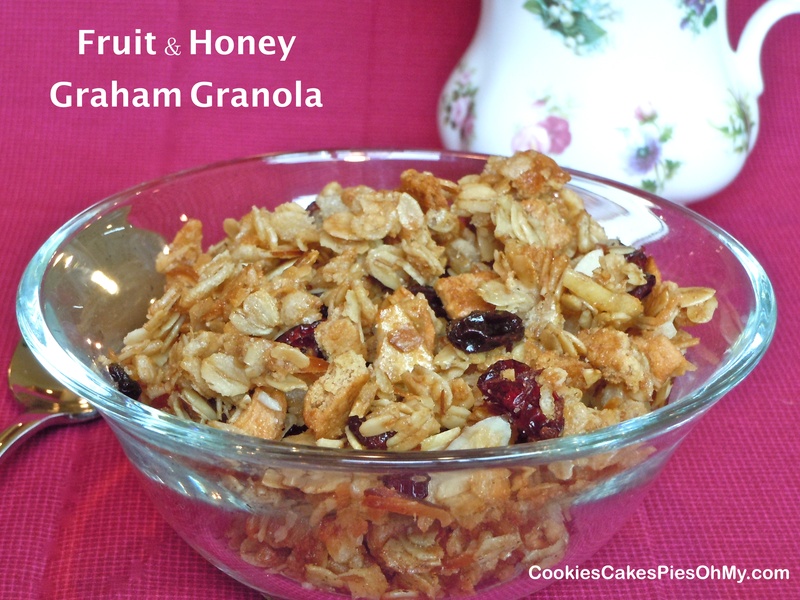 It is summer, and I always make granola. Why? Well, I did it one year to take with us on our family vacation to Sun Valley ID and then did it the next year and now…well it’s tradition! We can’t go without it, it just wouldn’t be right! 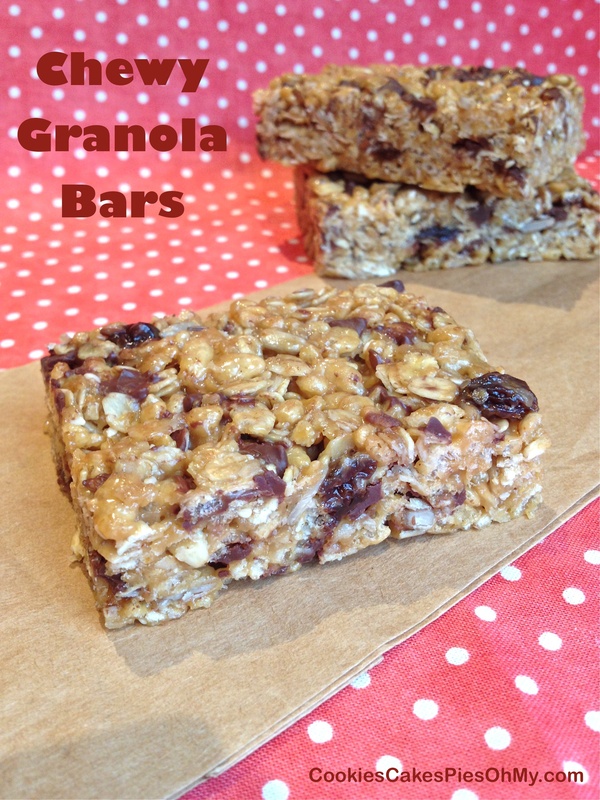 Great for breakfast or snacking anytime. Preheat oven to 350°. In large bowl, stir together Rice Krispies, graham cracker, oats, almonds, raisins, apple, banana, and Craisins. In medium bowl, stir together melted butter, brown sugar, and honey. Pour over oat mixture and gently stir to coat. Spread evenly in two baking sheets sprayed with non-stick spray. Bake for 8 minutes, take out and stir. Trade tray placement in oven, top goes to bottom rack and bottom goes to top rack, bake for 8 minutes more. Remove and stir, trade placement of trays in oven again and bake for 8 minutes more. Watch closely, don’t want the granola too brown (stir again if necessary). After removing after third 8 minute baking, let trays of granola cool completely. Break into chunks, desired size and keep in in airtight container. Ready to crunch, yum! Preheat oven to 375°. Cream butter, sugar, and brown sugar. Mix in eggs and almond extract. Stir together processed almonds, flour, oats, corn starch, baking soda, and salt; add to creamed mixture and mix until combined. Stir in 1 cup sliced almonds. Drop scoopfuls of dough onto silpat lined sheet or sprayed cookie sheet. Press down slightly with glass bottom dipped in sugar. Bake for 9-10 minutes, do not over bake, you want them to be tender. Frost with following frosting when completely cooled. With electric mixer, whip butter and honey. Add powdered sugar and enough milk to make desired frosting consistency. If you are interested in Demarle bakeware and kitchen tools such as the Silpat & Perforated Baking Sheet please visit mydemarleathome.com/kristenparker or simply click on the Demarle at Home logo below. On the hunt for a little roll that makes a statement all on its own for a wedding reception. 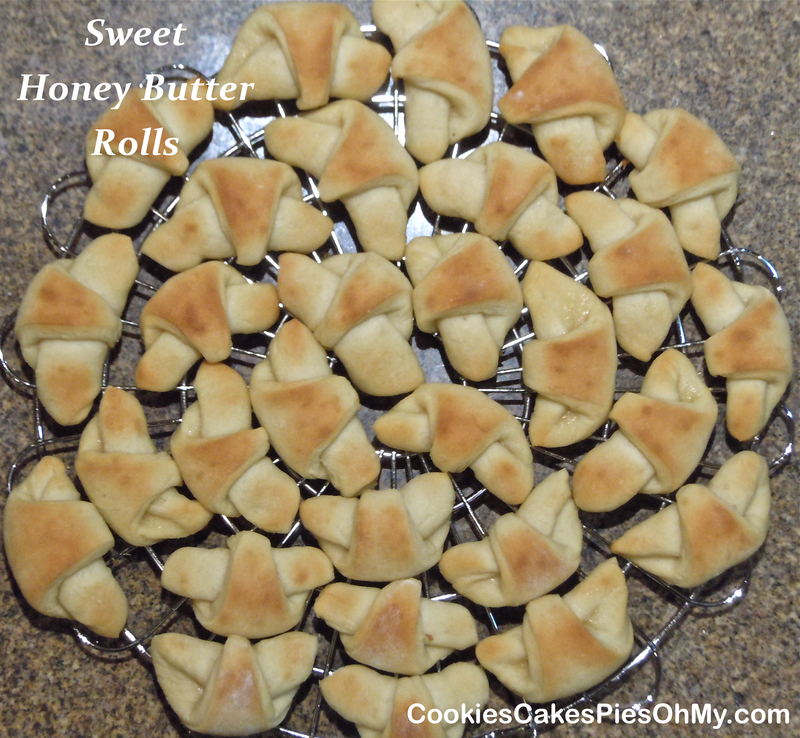 We are liking this, a sweet dough spread with honey butter, rolled, and baked to golden brown. I think if I took a little more time I could make them look nicer, I was in a hurry and it shows. But, love that honey butter flavor! For honey butter, stir together butter and honey, put in refrigerator. For sweet dough, in large bowl of mixer pour warm water, sprinkle yeast over water, and sprinkle 1 Tbl sugar over yeast. Let yeast sit for 5 minutes. Add warm milk, 1/3 cup sugar, egg, butter, flour, and salt. Mix and knead. Put dough in sprayed bowl, cover, and let rise one hour. Divide dough into 4 equal pieces. Roll one piece into a 8″ diameter circle, spread with 1/4 of honey butter mixture, cut with pizza cutter into 8 equal triangles. Roll each starting at big end up to the point. Place on silpat lined baking tray or sprayed baking sheet point down. Repeat with remaining 3 pieces of dough. Let rise 30-45 minutes. Bake in preheated 350° oven for 10-12 minutes or until just golden. Makes 32 small rolls. Cupcake time! 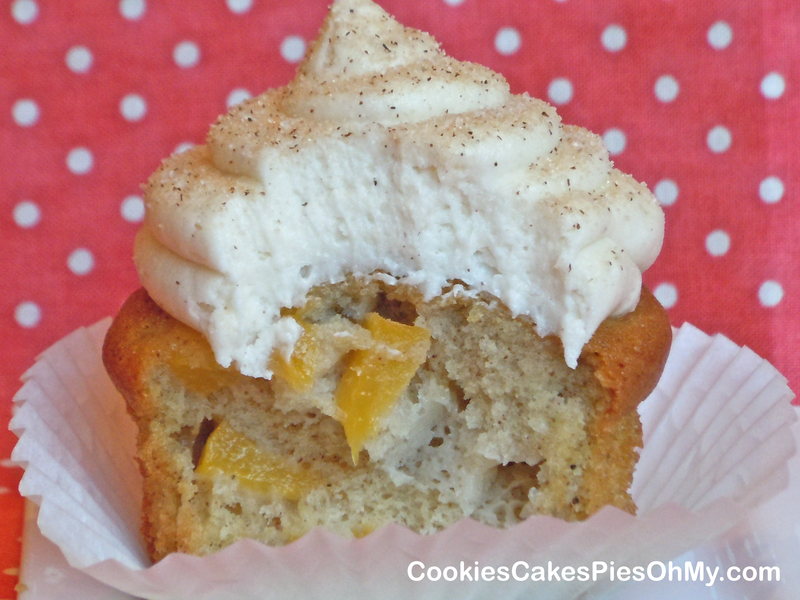 A tender Peach cupcake with a hint of cinnamon and nutmeg topped off with a creamy cinnamon honey buttercream frosting sprinkled with cinnamon sugar. It’s a peach! Preheat oven to 350°. Prepare cupcake pans with papers, recipe makes 18 cupcakes. Stir together sugar, flour, baking powder, baking soda, cinnamon, nutmeg, and salt. In large bowl with electric mixer, mix eggs, oil, peach juice, and vanilla. Mix in dry ingredients. Fold in peaches. Scoop batter into prepared cupcake cups, filling papers almost to top. Bake for 18-22 minutes, until top center is set. Cool completely. With electric mixer, cream butter and shortening. Add powdered sugar, cinnamon, cream, and honey. Beat until whipped creamy frosting consistency. 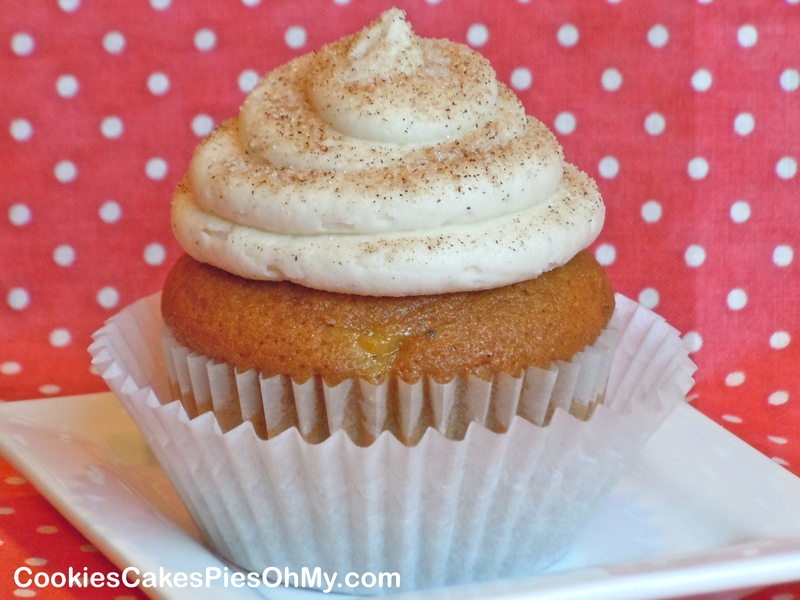 Frost cooled cupcakes and sprinkle with cinnamon/sugar.